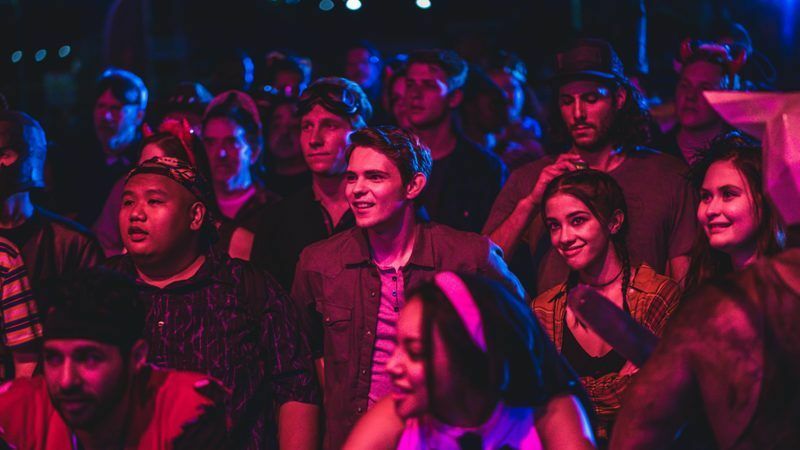 It will surprise no-one who is a fan of fun, punk-ethos Indy studio Rooster Teeth their latest live-action film is a supercharged, gleefully genre-mashing and referencing outing with as many laughs as it has splatter (and even the odd quiet, emotional, character moment). Owen Egerton writes, directs and indeed stars as the leering, bloodthirsty showman (I could imagine Alice Cooper playing this role when younger) who orchestrates the eponymous Blood Fest, a festival for horror fans. Within the large, walled grounds (actually a re-dressed Renaissance Fest location in Texas, we were told at the post-show Q&A) there are multiple locations based on horror genre tropes – the high school prowled by a serial killer, the circus with evil clowns, vampire girls seducing drunken lads, zombies and more. 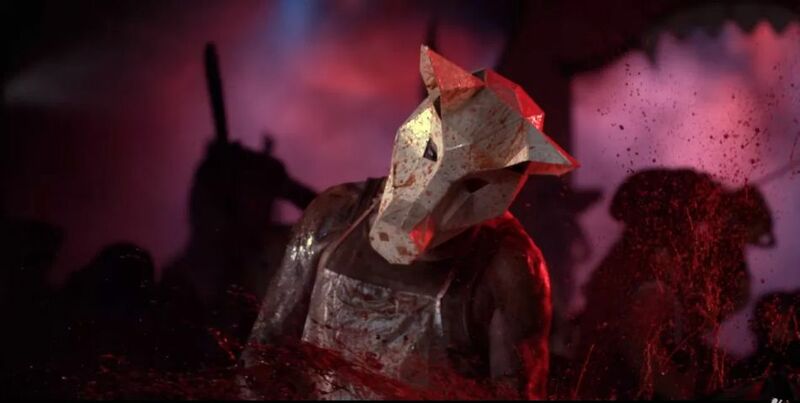 In a film which revels in multiple, loving references and homages both to other Rooster Teeth creations and many horror movies (even the title is a nod to the famous/infamous Blood Feast), Blood Fest opens, rather nicely for an old horror fan like me, with a nod to Carpenter’s Halloween, zooming in on the suburban American neighbourhood on Halloween, and a young boy watching classic Universal horrors with his mum. Until a shadowy figure is glimpsed when she goes to the kitchen for snacks (a scene telegraphed by the tell-tale sign of the room light refusing to come on, a deliberate take on a generic device in slashers). Fast forward and that young boy, Dax (Robbie Kay) is now a young man, and one who has embraced the horror genre as a coping method for dealing with his fears and his horrible experience of seeing his mother murdered in front of him, before being rescued by his father. His father who is a famous psychologist and who blames the entire horror genre for creating the urge for violence that killed his wife (carefully ignoring his own culpability – the murderer was one of his own patients). Needless to say the father is not going to allow his son to go off with his friends, Sam (Seychelle Gabriel) and Krill (Spider-Man Homecoming’s Jacob Batalon) to the largest, splatterest horror gathering ever, and equally needless to say our plucky teens find a way around dear old dad, who is busy telling network television how horror is to blame for everything bad in society while the kids sneak off to indulge their love of the genre. And I doubt it will surprise any horror fans that (bit of a spoiler alert!) 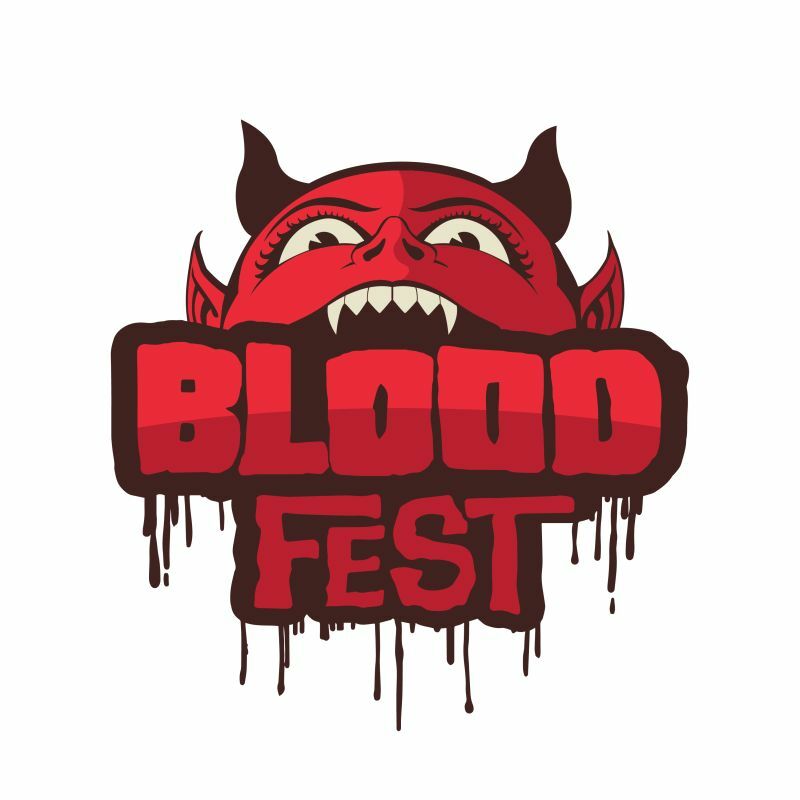 that Blood Fest is not exactly what it seems. 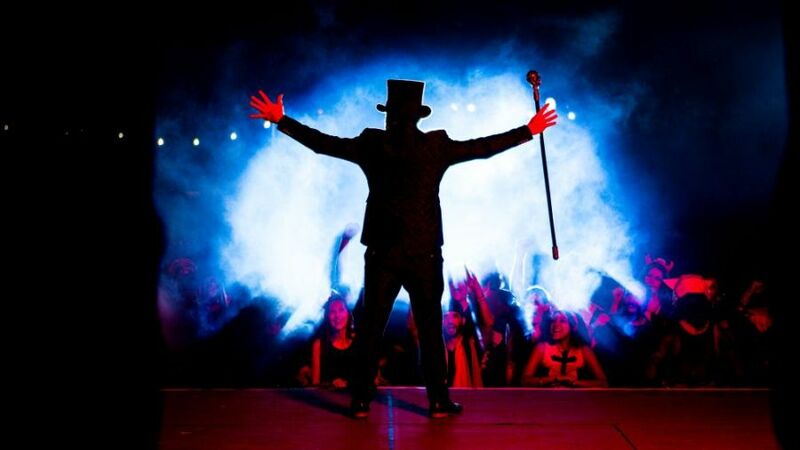 When the showman takes the stage for the opening ceremony (Egerton again) and bemoans how stale the genre has become, how mainstream (“we put Freddy on a lunchbox!”) then cries out to his baying crowd that they want to make horror scary again, I think most genre fans will suspect what is coming (and if not the bouncers standing between the crowd and stage, clad in pig-head masks also telegraph trouble in advance). The blood here is not fake, the fans are trapped inside this compound as the showman makes his own demented horror to end all horrors by filming them as they are slaughtered in a variety of horror tropes (this includes zombies with Go-Pro cameras strapped to them to record the carnage!). I don’t think that’s much of a spoiler though, as this happens very early on in the film and is pretty much the basis of it – also, as I said I think serious horror fans (who are the main audience for this, after all) will guess what is coming, at least for that part. After that reveal and the commencement of the carnage it becomes a battle of survival for our young friends who have to cross the various themed horror locations to try and escape. Along the way Egerton packs in so many references to a multitude of horror films, but this is done in a fast-paced, loving and hugely fun manner – this is the film-makers letting us know they too are fans and winking to us, we’re all in on this together. Who is going to make it, who is going to die, how are they going to die? Egerton and his team take us on a well-paced rollercoaster, gleefully throwing in slapstick as well as splatter, and sometimes both at the same time, as well as delighting in doing a little genre-mashing. For all the well-paced fun and loving references to the genre’s history, however, there are some serious elements in here; not for the first time horror, that genre often much-maligned by certain groups in society, holds up a distorting mirror to that society. The reactionary elements blame the genre for everything bad in the world – this is not unlike the idiotic Wertham “Seduction of the Innocent” which blamed comics, especially horror comics, for a perceived growth in societal ills. In recent decades is has been horror movies, rock music, rap music, video games and others that are easy to blame rather than turn attention to what is really wrong, what really causes violence in society, and, without giving too much away, there is a later element in this frantic fight for survival where Egerton makes clear that there are other forces in society that we should be far more worried about than horror-inspired slashers, killer clowns and monsters. It’s clever, fun, well-paced, packed with multiple references for fans to pick up on, laced with dark humour and even a few gentle character moments and emotional elements, it’s pretty much ideal for most horror fans, I think, I can easily see this becoming a future cult horror flick. Egerton and a bunch of the Rooster Teeth family were at the Edinburgh Film Festival UK premiere of Blood Fest, and Egerton especially was on terrific form, full of energy, talking up the crowd both before and after the showing like a delightfully demented horror version of PT Barnum. There was a group of Rooster Teeth fans in the audience and the interaction between them and the film crew, and the other audience members (some of whom were new to RT productions but clearly looking forward to seeing more), was terrific, there was just such a huge, positive, good-natured vibe at this late night festival screening, and Egerton et al seemed more than happy to be invited to such a prestigious film festival and join their long-running roster of late-night horror delights. One of the Rooster Teeth producers was asked when the film would be getting a UK release; he replied they couldn’t say just yet, but that they would be making an announcement very soon, so keep an eye on the RT site and twitter for more, because this is one horror hounds are going to lap up. This entry was posted in film, horror, reviews and tagged Blood Fest, Edinburgh International Film Festival, EIFF, EIFF 2018, film review, horror, Owen Egerton, review, reviews by Joe. Bookmark the permalink.